23 Oct - #WhistlerUnfiltered: Candid, uncensored Whistler moments straight from the peoples lens. If the adage that “a picture is worth a thousand words” holds true, many a conversation will be had about Whistler this winter as word-of-mouth spreads through a new competition, launched recently to gather together a collection of unofficial, uncensored, candid snapshots and moments telling the story of winter in Whistler. 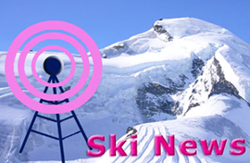 Two new runs have been created ready for the coming winter at Cervinia in Italy's Aosta Valley.